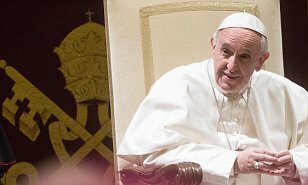 The Pope wants couples to have fewer children in order to lessen the environmental damage being done to the planet, a Vatican panel has been told. Environmentalist Peter Raven made the comment at a workshop on biodiversity, which discussed Catholic Church attitudes toward environmental issues. Pope Francis has previously said avoiding pregnancy is not an 'absolute evil', but the church remains unwavering in its opposition to artificial birth control.